This post has been read 383 times! 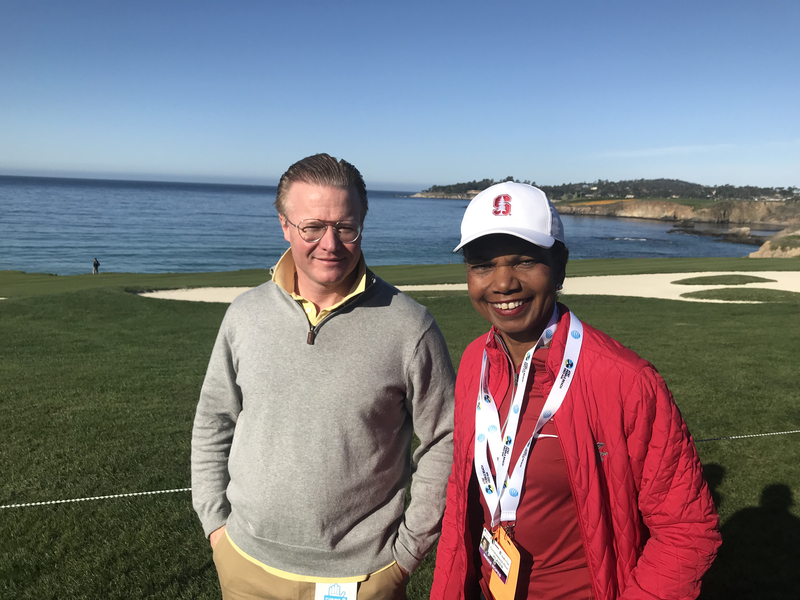 On a recent trip to Monterey, I noticed that a PGA player I follow, fellow Ohio State University alumnus Ryan Armour, was going to be paired with an amateur at the AT&T Pebble Beach golf tournament that started on Thursday. The amateur’s name is Peter Barker and he is a member at the super exclusive Cyprus Point Club. He had taken Armour to Cyprus Point on Wednesday and they posted photos. Later, on the 16th hole, Barker hit a drive by me and then a good second shot. I complimented the shot and made a joke about kissing up to him to play Cyprus. Surprisingly, he engaged nicely. I saw no signs of the typical arrogant golfer that I see so often with members of golf clubs. I can size up people and guess their professions. I guessed that Barker was in Wall Street. I was right. Peter Barker is a Goldman Sachs alumnus who then ran operations in California for JP Morgan Chase. He now serves as a Director of Franklin Templeton Funds. He was representing the charity of the Fletcher Jones Foundation at the tournament. After the tournament was over, I was outside of the clubhouse by the road with hundreds of others trying to find a shuttle bus or taxi when up walked Barker carrying his own bag. I said, “I followed you.” He shook my hand, and we discussed Ryan Armour. I had assumed that he knew him from some sort of Ohio State connection, but he did not. He expressed his respect for Armour due to his good swing. This is a good example of how the sport of golf should be played. Titans of industry are humbled by the game and respect it. The PGA player that Barker was paired with was held in high esteem by a wealthy man with a house on Cyprus Point. The respected currency Ryan Armour possessed was a golf swing. On the venue of Pebble Beach, Ryan Armour was the rich guy. If one can master one’s body and overcome the inner demons in order to swing a golf club well, then one has more wealth than anything that is material. Because a good swing cannot be bought, it is priceless and becomes a spiritual pursuit. Wealthy Peter Barker is striving for golf wealth like anyone else. That is why I started The Golf Project two years ago after moving back to Ohio. I am close to being wealthier than almost anyone else because I understand the secrets of the swing that elude even most PGA pros. I feel like am part of a very cool secret society. The ideal golf club should be a place where people of high moral character gather in pursuit of the elusive perfect golf shot. It should not be a place for schmucks to gather and pretend to be important by putting on an eminence front. Out-of-date stodgy dress codes do not make a club of average people a prestigious place. Good people who place the pursuit of golf over socializing, tennis, and summertime babysitting, are what make a club worthy joining. Wealth can buy ridiculous yachts that cost thousands of dollars in fuel just to leave the dock. Wealth can buy a plutocrat a newspaper to use as a propaganda outlet giving the ego boost of political relevancy. But wealth cannot buy health, happiness, and a good golf swing. The richest people in the world are envious of people who have those attributes. Bonus essay: Do you want to know the secrets of the golf swing? I will tell you. In a nutshell, you have to turn the shoulders properly in the backswing. Our bodies want to fight that. Then, on the downswing, be sure to have the feet stay flat, in contact with the ground. You twist the torso and hips using the ground. Look at videos of David Toms or Payne Stewart. This entry was posted in Doctors, Dentists, Events and Activities, Life Lesson Essays, Op-Ed, Outdoor events, Sports and fitness, Tip of the Week, Videos, Wall Street and Real Estate Essays. Bookmark the permalink.